Of course everybody knows that today is Thanksgiving, when all across the U.S. families and friends get together to celebrate, eat themselves silly and enjoy the spirit of the occasion. When families come together though it’s always a good idea to have some activities lined up for the kids to keep them busy and entertained. With this in mind we thought we’d give you details of some of the best iOS apps for iPhone, iPod touch and iPod as well as some Android Thanksgiving apps for kids activities, such as coloring. There are an amazing amount of Thanksgiving apps available and targeted especially for kids, with activities such as games, painting, stories, crafts and more so check out the following suggestions. Simply click on the app titles to be taken directly to the App Store or Google Play to download the apps. You may also be interested in our earlier article about Thanksgiving recipes. To start with we have an iOS app with a highly-rated game aimed at kids between the ages of 3 and 8. 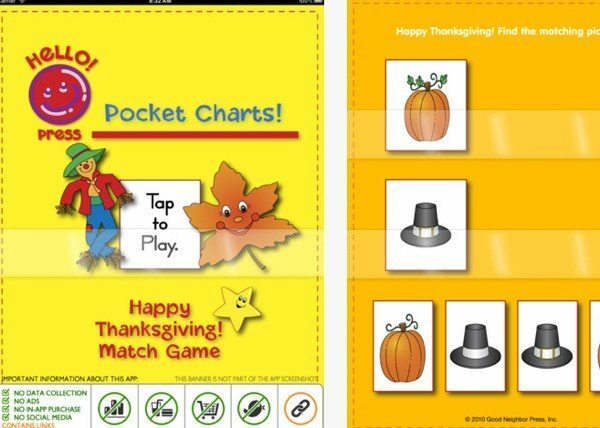 The Thanksgiving Matching Game is a free app for iPads running iOS 3.2 or later and as well as giving the kids some fun is also educational so they will be learning at the same time. It’s great for kids with short attention spans as the game lasts for up to 5 minutes and reinforces memory skills. It’s colorful and fun and we think that many kids will enjoy this game. Another app that would be good for children who like coloring is Kids Fingerpainting Thanksgiving. This is another free iOS app and compatible with iPhone, iPod touch and iPad running iOS 3.0 or later. There are 10 different coloring pages with 10 pre-set colors, a customizable palette and also a blank page for drawing. 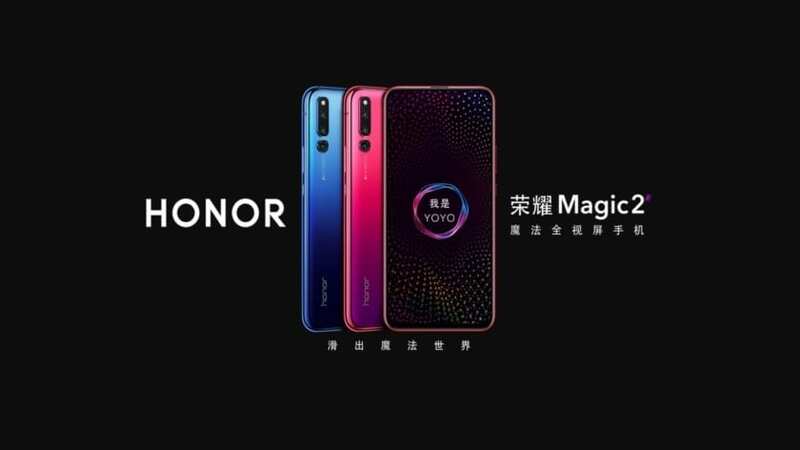 Features include variable brush size, a Photo Library where kids can save their pictures and the ability to add frames and even autograph their creations. One for the more creative is Candle Craft for Kids and Moms, compatible for iPhone, iPod touch and iPad running iOS 3.0 or later. This one is priced at $0.99 so is still very reasonable and can be used at any holiday time of year with candles to make for every occasion. This app is a photo-book with step-by-step instructions to make candles and is a great way of keeping the kids amused as well as introducing a new hobby. There are instructions to make 8 different kinds of candles with high quality images and an easy to navigate menu. 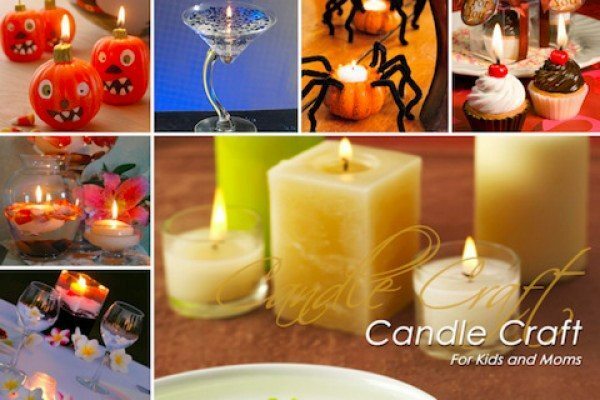 Just some of the wonderful candles this app will help kids to make include the cinnamon roll candle, floating candles, cupcake candle and mosaic candle holder. Our final iOS app suggestion is Word Spree: Thanksgiving Lite, another free app for iPhone, iPod touch and iPad running iOS 3.1.3 or later. Come up with some funny Thanksgiving-themed stories by filling in your own words and also share the stories with friends on Facebook and Twitter. 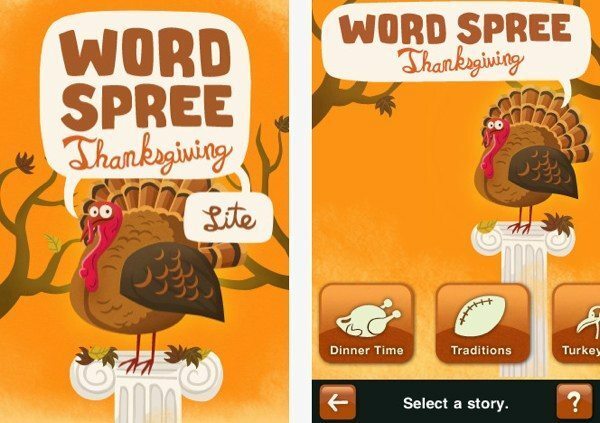 The game has 15 different stories with Word Spree categories such as Turkey Tales, Dinner Time Traditions, Family Gathering and Giving Thanks and story titles including Embarrassing Family, Grandma’s Recipe, and Monster Turkey. Now we have an Android app called Thanksgiving Cards. This is a free app for devices running Android 1.5 or later and includes great greetings for kids to send to parents, grandparents, siblings and others at this special time. Another highly rated app this one also includes some quotes and you can share via Twitter or Facebook or send by MMS. The final app idea we have for you is Thanksgiving Coloring Book. This is free but for a short time only and is for devices running Android 2.1 or later. Features include unique color in the lines, zoom in and out, the ability to save pictures to the gallery, use of a paint bucket tool, over 60 colors and plenty of coloring pages to choose from. Hopefully there is something here that most kids will enjoy that will enhance your Thanksgiving 2012 and give them lots of fun. 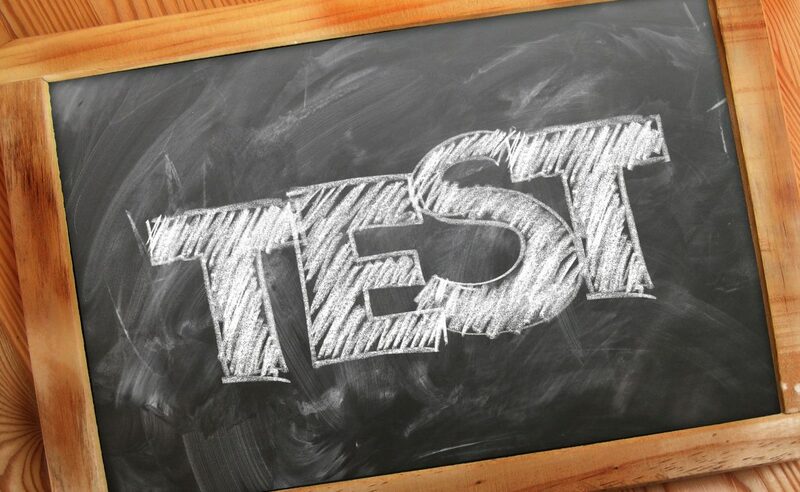 If you enjoy any of these apps let us know by sending your comments. The only thing that remains for us to say is Happy Thanksgiving!